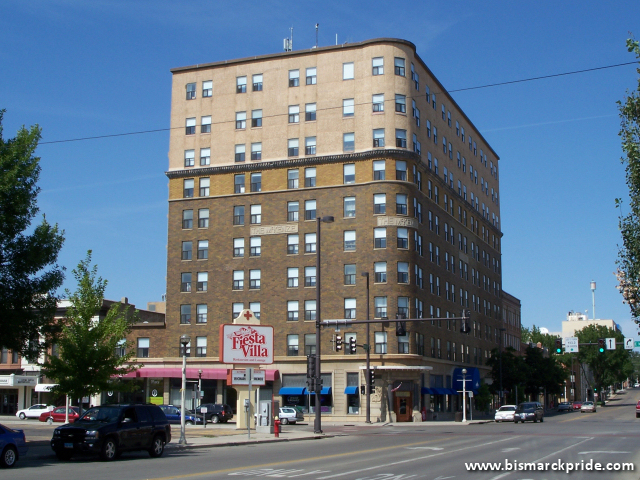 The Patterson Hotel (originally McKenzie Hotel) is a historically significant building in downtown Bismarck that was once a prominent hotel known for its strong political ties and illicit activities. Among other celebrities, the Patterson hosted four U.S. presidents. The hotel was completed in 1910 and opened on New Year’s Day, 1911. It was North Dakota’s first building constructed with steel reinforced concrete and is notable for its continued construction that spanned decades, ultimately expanding from seven stories to ten. Deemed North Dakota’s first skyscraper, the building was the tallest in the state until the new Capitol’s completion in 1934. Upon opening, it was the largest hotel within a 4-state region, contained the most private baths (84) of any building in the state, and held the city’s first elevator. Today, it remains the state’s second-tallest building. The building operated as a hotel from 1911 until 1978. It was condemned in 1980 and re-opened as Patterson Place senior apartments in 1983 following a $5.6 million renovation project. Housed in the former hotel’s lobby, Peacock Alley Bar & Grill is the city’s oldest restaurant still in operation, having first opened in 1933. The building was placed on the National Register of Historic Places in 1976. 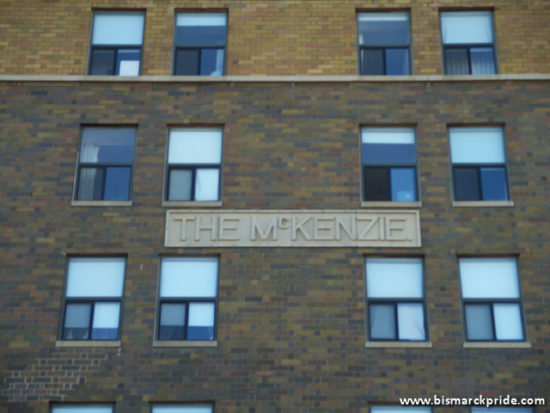 Original McKenzie Nameplate on the Patterson Hotel. Originally the McKenzie Hotel, named to honor local political boss Alexander McKenzie, the hotel opened New Year’s Day, 1911. It was developed by local businessman and fellow politician, Edward Patterson, who was a close friend to McKenzie. The hotel’s name was officially changed to Patterson Hotel in March 1927; however, there are numerous references to it being called “Patterson” as early as 1922 following McKenzie’s death. Upon opening, the 7-story, 150-room hotel was the tallest building and largest hotel located in all of North Dakota, South Dakota, Idaho, and Montana. It also contained the most private baths (84) of any building in the state. It also contained the city’s first elevator. The McKenzie was poised as Patterson’s first-class addition to his Northwest Hotel and mid-class Soo Hotel. Patterson did not initially intend for the McKenzie to span seven stories. It wasn’t until realizing the impracticality of acquiring an additional 25 feet of frontage along Main Avenue that he opted to build vertically. Even at that, the original objective was only a 5-story structure with a foundation designed to support additional stories to be later added. Its scale was enlarged to encompass seven stories while excavating the foundation. The foundation reportedly could withstand up to twenty stories. In an effort to avoid paying property taxes, the Patterson Hotel saw continued expansion until the 1930s, ultimately enlarging from its original seven stories to a towering ten stories. At the time, city code stated that property property taxes could not be collected on a building until construction was completed. The first significant expansion commenced in 1915 when Patterson acquired the land between the hotel and Patterson Block along Main Avenue. The expansion temporarily ceased when the United States entered World War I. A rooftop garden was added in 1920 – the first such amenity west of Chicago – and enlarged the following year to include a bigger dance floor and enclosed dining room. Construction on the eighth and ninth floors was first announced in 1929, but weren’t completed until 1931. The tenth floor was completed by 1932, which also added the Sky Room and Tip Top Lounge. Ed Patterson retired from daily operations on January 1, 1930 when he leased the hotel – and adjacent Princess Hotel – to C.E. Danielson of Minot. Danielson – who had operated Minot’s Grand Hotel since 1917 – also bought the hotels’ furnishings and equipment from Patterson. The Pattersons maintained ownership of the buildings themselves and continued residing in the namesake hotel. Edward Patterson died in 1945. His wife, Rose Judge Patterson, continued operating the hotel until her own passing in January 1975. Ownership of the hotel then passed to her estate. By the 1970s, the Patterson Hotel’s glory days were well behind. Completion of Interstate 94, competition from modern hotels, and a decaying downtown ultimately lead to its ultimate closure in 1978. After ongoing attempts to revitalize the hotel failed, the building was officially condemned in 1980. In 1976, the building was placed on the National Register of Historic Places, which likely saved it from imminent demolition. The building was sold to 10 local investors in 1977, who intended to invest $1.5 million in renovations to restore it into a 1920s-themed first-class hotel with a convention center and fine dining establishment. The planned project was to include dual glass elevators on the building’s northwest exterior, a retail mall area, atrium, and valet portico. Unfortunately, those plans never came to fruition. On May 2, 1978, the Patterson officially ceased operating as a hotel. By that time, much of the building was being used as residential apartments and office space, which were allowed to remain for the time being. By October, building residents – roughly 60 of them – were encouraged to obtain new housing. Condemnation papers were first filed in August and utility operator MDU was threatening to discontinue services due to outstanding bills. Once again, the building’s future remained in doubt. In 1980, a new group of investors seeking to renovate the building obtained approval for Municipal Industrial Development Act bonds, which was the first positive step towards saving the building. Financing remained a hurdle, however. Renovation was expected to cost up to $6 million and purchase of the building included liabilities totaling an estimated $300,000. Controversially, the City of Bismarck also agreed to provide TIF funding for the building’s renovation. That funding was later jeopardized, however, when concerns surfaced that the funds were inappropriately approved. At the time, TIF could not be used on privately-owned buildings. In August 1980, an official order for condemnation was filed after an inspection highlighted concerns with electrical, plumbing, and its heating systems. Structural issues were also discovered. The building was ordered evacuated the following month. In February 1981, the City Commission delayed the condemnation hearing after new investors surfaced. The following month, the Commission approved a 120-day delay for the condemnation order while the building’s investors secured final mortgage insurance and approval. At least one Commissioner suggested that no other delays would be granted. Renovation efforts took another step forward in April after HUD committed to rent subsidies, in exchange for the property to be used as affordable senior housing. This commitment by HUD was considered the last hurdle to mortgage insurance approval. In a stroke of luck, Ginnie Mae approved a $5.5 million federal loan for the project, at 7.5% interest over 40 years. The Patterson project was chosen in a computerized lottery. The addtional funding required, for restoration of the non-residential portions of the building, were funded privately and through TIF. After years of setbacks and delays, renovation was finally complete in 1983. The former hotel re-opened as Patterson Place, housing 117 affordable senior housing units. The first tenants occupied the building in April, with a formal dedication in October. Peacock Alley re-opened in the hotel’s former lobby in 1984. It was first established in 1933 (some sources cite 1938) in what is now the lobby of Patterson Place apartments. The Patterson Hotel was a major gathering place for politicians and businessmen alike. This especially held true, after 1921, when it became home to the Nonpartisan League after the League’s former headquarters at the Northwest Hotel, which Patterson also owned, was destroyed by fire. The Patterson also housed state government offices after the State Capitol was destroyed by fire in December 1930, until the replacement capitol was completed in 1934. Among other celebrities, the Patterson hosted four U.S. presidents: Theodore Roosevelt, Calvin Coolidge, John F. Kennedy, and Lyndon B. Johnson. The McKenzie/Patterson was known for its illicit activities during its infancy, including illegal alcohol sales, gambling, and alleged prostitution. The hotel even installed an electronic alarm system to keep out “unwanted guests” from interfering with its affairs. The fact that alcohol was illegal until 1933 didn’t stop the Patterson from serving it during prohibition. Local alcohol sales was banned in 1889 when North Dakota was admitted as a dry state, then carried over during the nationwide prohibition. Rumors also exist that an underground tunnel once connected the hotel with the train depot, located across the street, to secretly smuggle contraband and guests. This is unconfirmed, officially. When the state moved into the Patterson following the Capitol fire, it was the entire second floor that was leased.